I always like new challenges, things I haven’t done before. 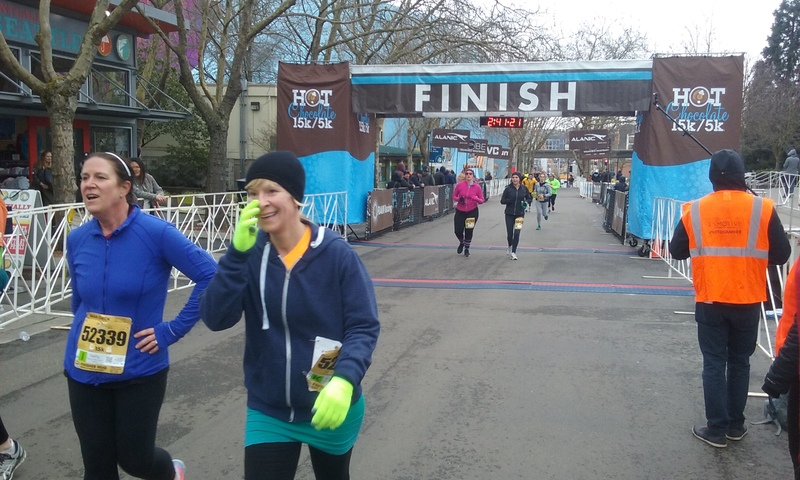 So on this year’s list was running the Hot Chocolate 15K in downtown Seattle. 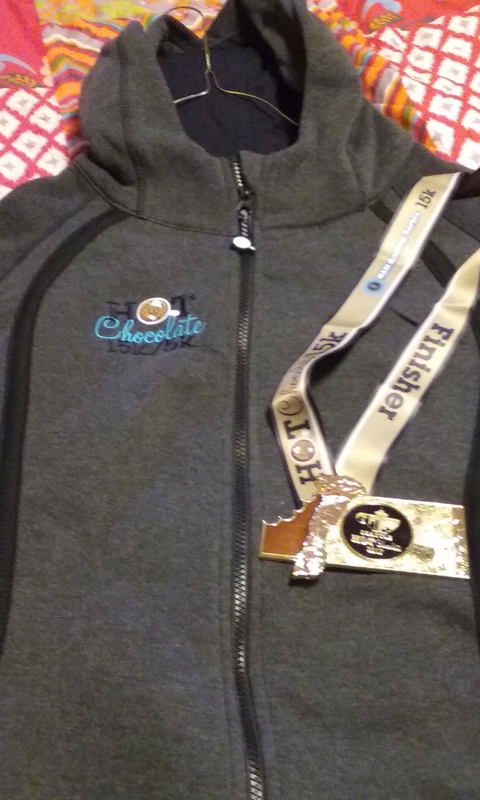 I ran the Hot Chocolate 5K for the first time last year, but had never done a 15K race (9.3 miles) before. I got my chance last Sunday (March 6), and the results were … well, somewhat disappointing. But more on that a bit later. 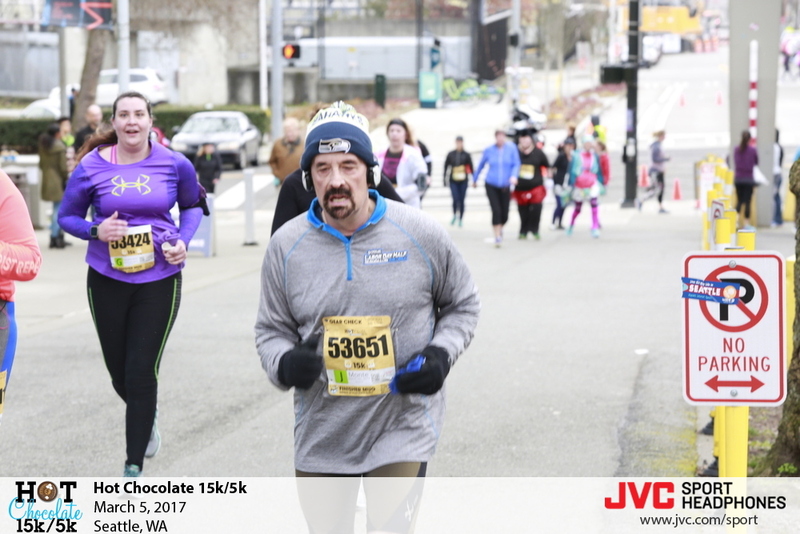 Let me first talk a bit about the Hot Chocolate 15K/5K races in Seattle. It was the fourth year of this event, part of a national series that benefits the Ronald McDonald House Charities. It has to be considered a success. 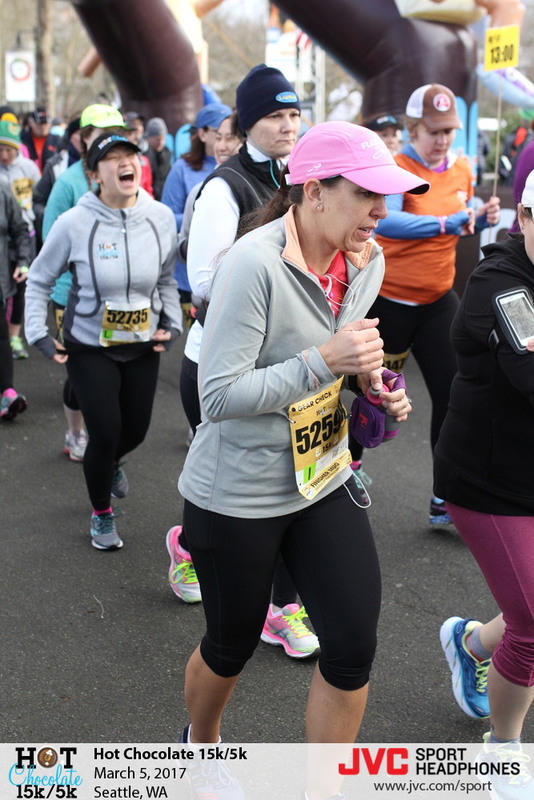 More than 10,600 runners and walkers turned out for the races on a cold day when rain or snow was the forecast. The 2017 participation beat last year’s strong turnout by more than 300. The Hot Chocolate event has impacted the turnout of March races such as this Sunday’s St. Patrick’s Day Dash 5K, which has long been one of Seattle’s biggest road races. chocolate; some rich, melted chocolate for dipping; a banana, some pretzels and some cookies. I personally ate and drank all of mine. The fleece jacket: Participants get more than a T-shirt or running shirt. This year, they got fleece jackets that look pricy, even if they really aren’t. Anyway, they’re warm and in-season, and even if I don’t see a lot of them around town, I believe they’re being worn. The distance: The 5K is the bigger draw (6,092 finishers) and a popular distance, but 4,511 ran or walked the 15K as well. The latter is seen as a good training run for a half-marathon, which seemingly many women plan or aspire to run. The emails and training plan: Registrants received a series of emails in the weeks leading up to the run, with training and workout tips for that week. This guidance was sure to be helpful to new runners seeking to improve their times or just finish. The medals: I won’t put much emphasis on this one, as many local races provide finishers’ medals. But these medals (for 15K finishers only) were as good or better than many of my marathon finishers’ medals, and added a classy touch. The races start and end at Seattle Center, and I will talk about the hills in a second. But the fact that the course is centrally located in the downtown area is probably a draw as well. Hayley is the runner laughing at left. Don’t know why. At any rate, two of my faves as Allytics teammates and fellow runners, R.J. Ricker and Hayley Halstead, did the 15K with me. 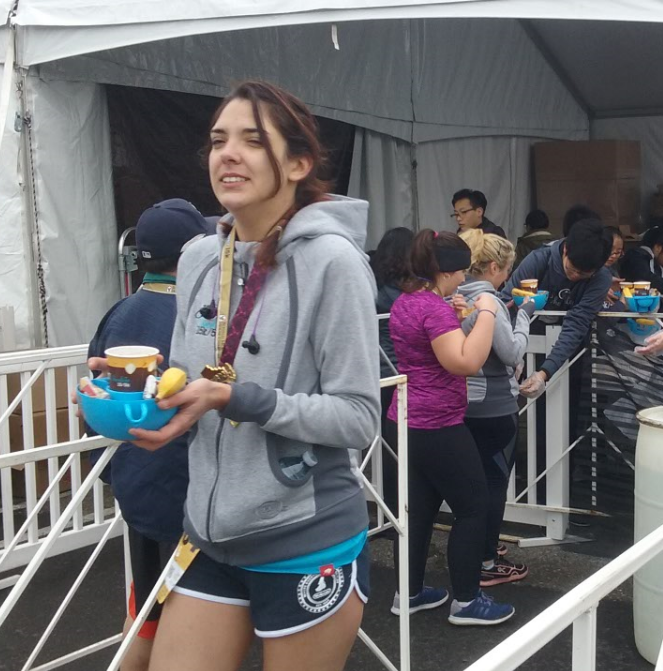 These two (millennials and women) are very discerning about the races they do, so their decision to run this one tells me the event organizers are doing something right. Even if R.J. denies the chocolate was a big deal to her. OK, about me. I was disappointed in my time — 2:16:08, or 14:37 per mile — because I was hoping to come close to breaking two hours, and I didn’t expect to run so slowly up the big hill. Another reason: Many of my half-marathon times in previous years are better than this. It’s not true that I stopped and had breakfast in the middle of this run; it just looks like it. Roughly, miles three through six are up the Aurora Avenue hill heading north from downtown Seattle. You feel like you’re headed to the Canadian border, but you do finally turn around at mile 6 and head back down the hill. I ran the entire race without stopping, even for water. But going up this hill on my bad ankle, I was getting beat by some of the faster walkers, sad to say. No complaints about the course, however. It’s a long, tough hill, but I climbed it before in the Rock ‘n’ Roll Seattle Marathon (2010) and the St. Patrick’s Day Dash (2010 through 2014, until they changed the course). Though my time going up that hill was unbearably slow, I ran virtually the same time coming back down, which was unfortunate and where I could have done better. Congrats to R.J. and Hayley, who posted exceptional 15K times, and another Allytics co-worker, Cassi Frickelton, who ran the 5K. It was nice that Hayley and her friend, Elisa, waited for me at the finish line. Thanks! 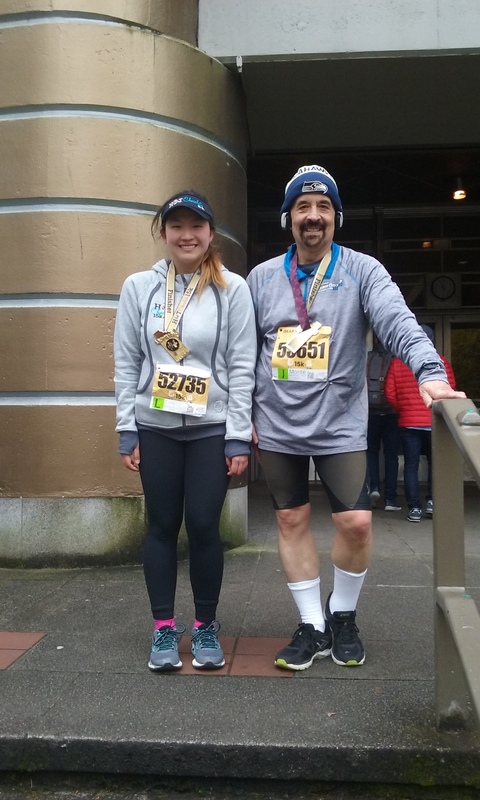 Congrats also to R.J.’s dad, Arthur, who ran his first 5K in a long time, and to former Zones teammate Tyra Nelson and her daughter, Taryn, who did the 15K. Nice job! This was my 208th road race! So far this year, I’ve run a 5K, 10K and 15K, in that order. 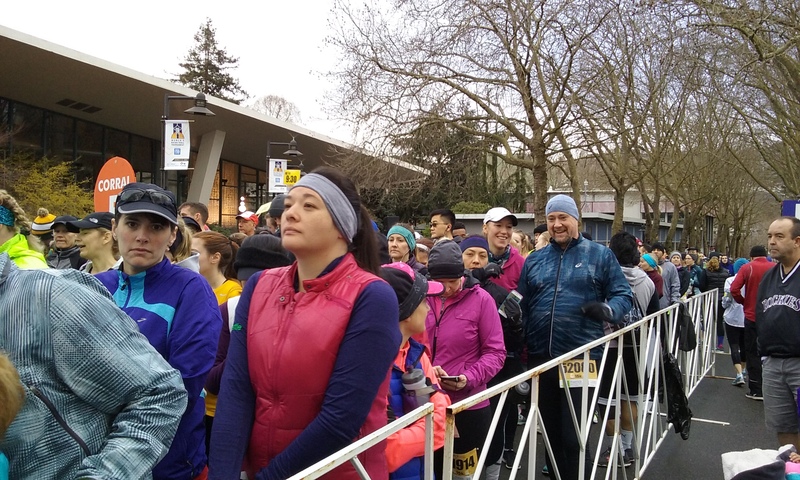 I am taking a vacation later in March and, as I said last time, am skipping the Mercer Island Half-Marathon (a 21K) on March 19 because of it. I’m already feeling guilty about it. (I’m also skipping this weekend’s St. Patrick’s Day Dash 5K.) My next run will likely be the Seahawks 12K Run on April 9, and I hope to be in better shape. I have lots of bike rides planned for April, May and June. 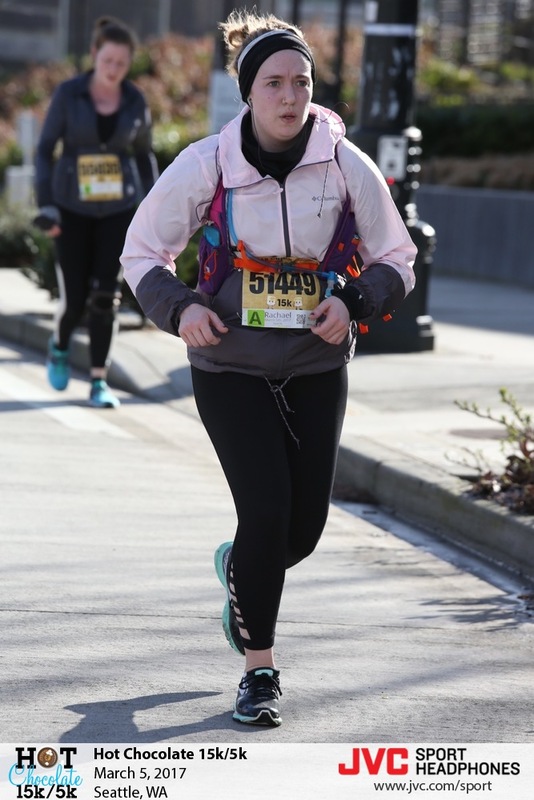 This entry was posted in 10K, 5K, Mercer Island Half-Marathon, Rock 'n Roll Seattle Marathon, Running, Seahawks 12K Run, St. Patrick's Day Dash and tagged 5K, Bicycling, Hot Chocolate 15K, Marathons, Mercer Island Half-Marathon, Millennials, Rock 'n Roll Seattle Marathon, Running, Seahawks 12K Run, Seattle Center, St. Patrick's Day Dash. Bookmark the permalink.